Political leadership and concrete action have led to good progress on creating universal and sustainable access to decent sanitation and drinking water, but additional efforts are needed to fulfil commitments by the 2014 deadline, a United Nations-backed partnership reported today. Deputy Secretary-General Jan Eliasson welcomed the “encouraging steps forward” detailed in the 2013 Progress Update issued by the Sanitation and Water for All (SWA) partnership. “I am especially encouraged by the increased budgets, strengthened national planning and reduced numbers of people practicing open defecation,” Mr. Eliasson said in a statement, congratulating those responsible for these achievements. The 15 developing countries that made specific commitments to tackle open defecation have made notable progress in scaling up community-based approaches to sanitation, according to the report. UN figures show that some 1.1 billion people still defecate in the open, leading the UN General Assembly this year to designate 19 November as World Toilet Day. Nine countries reported significant budget increases for sanitation and water and many leaders have given the water, sanitation and hygiene (WASH) sector higher political visibility. Others report progress in creating stronger information systems from which important decisions can be made, as well as improved planning and coordination processes. “The monitoring report shows exceptional achievements and illustrates that that political will and strong leadership can drive action, even in the toughest environments,” said SWA chair John Agyekum Kufuor. “I am immensely impressed that countries were able to translate commitments into action on the ground. This report shows that SWA high-level meetings add value,” he stressed. The SWA partnership – comprised of governments, donors, civil society organizations, development partners and several UN agencies – last met at a high-level meeting in April 2012, at which representatives committed to addressing barriers to delivery of sustainable water and sanitation services. Developing countries reported completion or good progress on almost 60 per cent of those commitments and donors on 80 per cent, according to the report released today. Meanwhile, only 44 per cent of country commitments and 42 per cent of donor commitments are on track to be achieved by the third high-level meeting of the SWA set for April 2014. Mr. Eliasson, who is also a member of the Secretary-General’s Advocates Group for the Achievement of the Millennium Development Goals (MDGs), said the challenge now is to maintain momentum and eliminate barriers to delivering the remaining commitments. The report showed that work remains to improve the effectiveness and sustainability of service delivery. According to the findings, more effort must also be made to include multiple stakeholders in the progress review process. While two-thirds of developing countries consulted with development partners, only 10 per cent solicited inputs from civil society and 10 per cent included the ministry of finance. Meanwhile, civil society has been engaged indirectly by donors in connection with the review. The goals of the partnership are in line with the targets contained in the MDGs, which world leaders agreed to meet by the end of 2015. The UN Children’s Fund (UNICEF) and the UN World Health Organization (WHO) announced last March that the world had met the MDG target for improved drinking water sources, but that many still lack safe water, and that the target for improved sanitation is lagging and will not be met at current rates of progress. Both agencies participate in SWA, along with the UN Development Programme (UNDP), the UN Human Settlements Programme (UN-Habitat), UN University (UNU), and the UN Entity for Gender Equality and Empowerment of Women (UN Women). 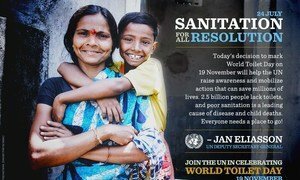 In a bid to make sanitation for all a global development priority, the United Nations General Assembly today designated 19 November as World Toilet Day, urging changes in both behaviour and policy on issues ranging from enhancing water management to ending open-air defecation.